Narrow lot homes are a welcome challenge for the team at Great Living Homes, we understand that you want your new home to be different to the others in your street and that the design needs to perfectly match the lifestyle of you and your family. We offer a limited range of standard narrow lot designs, however we have found through years of experience that custom designing narrow lot homes is far more beneficial because of the differing shapes and sizes of these smaller lots. Working off of standard designs is probably best left to larger blocks of land where there is more space to choose where and how the home will sit on the block. 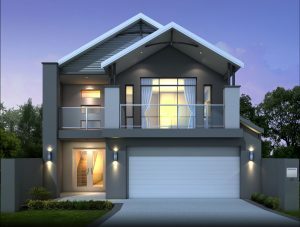 By custom designing narrow lot homes Perth you are more likely to end up with a home that is better tailored to your personal requirements and which also stands out from the neighbouring properties. It also allows you and your builder to determine how best to make use of every square meter of space you have, as well as take into account the best orientation of the home on the land to utilize your environment in the energy efficiency of your new home. The position of the house on the land determines how much natural light can penetrate the home, whether the sea breeze will flow through your home, how much energy you can harvest with solar panels and so on. All of these aspects contribute to the heating and cooling of the dwelling and can potentially mean huge savings in utility bills in the future! One of the tricks to building Perth narrow lot homes is to incorporate higher than normal ceilings and large windows into the main living areas thus making them feel lighter and more spacious. You always know the final product is a success when the clients get into their new home and they don’t notice they have walked into a narrow house because it feels so roomy and bright. Open plan kitchens which flow out to outdoor alfresco areas and fewer walls separating rooms are a great way to make narrow lot houses seem less constricted and feel more palatial. The location of a narrow block can also significantly affect the overall cost of building your new home. We all know that smaller sized blocks of land should cost less, but it also depends on where the block is located that can drive the prices up! For example, a narrow lot in an inner city suburb is going to cost a fair chunk more than the same sized block would cost further away from the city. Currently you can buy a narrow block of 345m2 in South Perth for $1.15 million dollars (with city and river views), a 340m2 block in Mount Lawley could set you back around $500,000 or a similar sized block at 337m2 in the southern suburb of Waikiki would only set you back around $215,000. As you can see, it’s all about location! So this is one of the first things you should consider before going ahead with a narrow lot home purchase. Buying your own land at 18 is almost impossible. But hey, Granny Flats!